High on quality, low on price.. The new ExcelPTZ with NiteDevil2020 is twice as good as the standard NiteDevil and turns night into day! All New NiteDevil2020 technology is capable of seeing in low light with less blurring than others and is now available in the PTZ505N standard speed and the PTZ605N high speed domes. 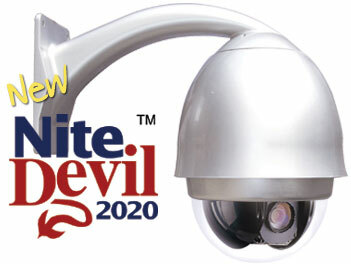 All new NiteDevil2020 technology gives you great results in very, very low light. For a free information pack on the excelPTZ range, click on the link above. This pack contains an information booklet about the excelPTZ range of CCTV cameras (excluding prices). Although we take great care to ensure that the details contained in our literature are correct, product specification may change without notice. © All contents subject to copyright, excelPTZ.com.